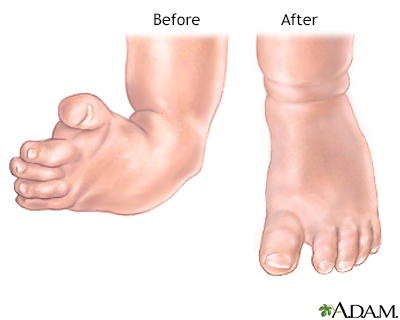 Clubfoot repair is surgery to correct a birth defect of the foot and ankle. Your child will have general anesthesia (asleep and pain-free) during the surgery. Ligaments are tissues that help hold the bones together in the body. Tendons are tissues that help attach muscles to bones. 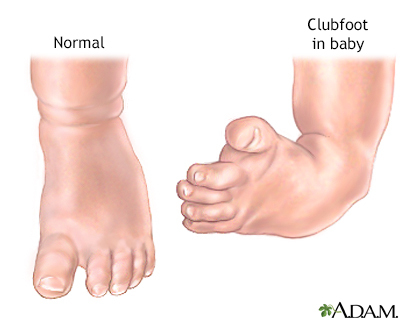 A clubfoot occurs when tight tendons and ligaments prevent the foot from stretching into the right position. To repair a clubfoot, 1 or 2 cuts are made in the skin, most often on the back of the foot and around the inside part of the foot. Your child's surgeon may make the tendons around the foot longer or shorter. 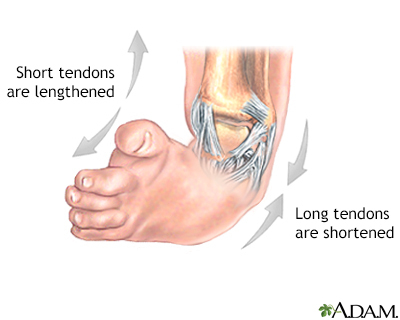 The Achilles tendon at the back of the foot is almost always cut or lengthened. Older children or more severe cases may need some bone cuts. Sometimes, pins, screws or plates are placed in the foot. 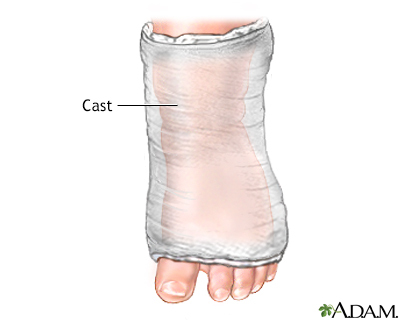 A cast is placed on the foot after surgery to keep it in position while it heals. Sometimes a splint is put on first, and the cast is placed a few days later. Osteotomy: Removing part of the bone. Fusion or arthrodesis: Two or more bones are fused together. The surgeon may use bone from somewhere else in the body. Metal pins, screws or plates may be used to hold the bones together for a while. A baby who is born with a clubfoot is first treated with a cast to stretch the foot into a more normal position. A new cast will be placed every week so the foot can be stretched into position. Cast changes continue for about 2 months. After casting, the child wears a brace for several years. The cast or other treatments do not fully correct the problem. A clubfoot was never treated. They still have foot problems after treatment. About 10 days before the surgery, you may be asked to stop giving your child aspirin, ibuprofen (Advil, Motrin), or any other drugs that make it hard for your child's blood to clot. In most cases, your child will not be able to drink or eat anything for 4 to 6 hours before the surgery. Only give your child a small sip of water with any medicine your doctor told you to give your child. Depending on the surgery that is done, your child may go home on the same day or stay in the hospital for 1 to 3 days right after the surgery. The hospital stay may be longer if surgery was also done on the bones. The child's foot should be kept in a raised position. Medicines may help control the pain. The skin around your child's cast will be checked often to make sure it stays pink and healthy. Your child's toes also will be checked to make sure they are pink and your child can move and feel them. These are signs of proper blood flow. Your child will have a cast on for 6 to 12 weeks. It may be changed several times. Before your child leaves the hospital, you will be taught how to take care of the cast. When the last cast is taken off, your child will probably be prescribed a brace, and may be referred for physical therapy. The therapist will teach you exercises to do with your child to strengthen the foot and make sure it stays flexible. After recovering from surgery, your child's foot will be in a much better position. Your child should be able to have a normal, active life, including playing sports. But the foot may be stiffer than a foot that has not been treated with surgery. In most cases of clubfoot, if only one side is affected, the child's foot and calf will be smaller than normal for the rest of the child's life. Children who have had clubfoot surgery may need another surgery later in life. Ricco AI, Richards BS, Herring JA. Disorders of the foot. In: Herring JA, ed. Tachdjian's Pediatric Orthopaedics. 5th ed. Philadelphia, PA: Elsevier Saunders; 2014:chap 23.